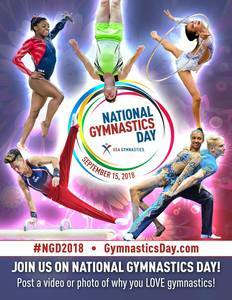 Come celebrate the 20th Annual National Gymnastics Day with us! We will be hosting a FREE "Open House" filled with obstacle courses and FUN! FIRST 30 Participants receive a FREE VeGa T-shirt!! Come check out our gym and learn more about our gymnastics class and team programs. All newcomers can enter to win a free year's membership, and participating kids will be eligible to win special fun prizes throughout this awesome event! Use the hashtag #NGD2018 on the pictures you post to follow the fun all around the nation! We look forward to flipping with you!